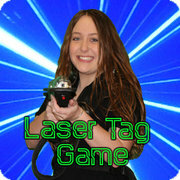 The Game: Bring a friend or two in for a game of laser tag and test your skills in our black light arena. Up to 16 players play during a game session where two teams of up to 8 players are suited up with a high tech vest and blaster, given safety rules and then escorted into our abandoned town. Our referee will provide instruction during the game to make sure everyone plays safe! You never know what surprises you will find as you dodge in and out of buildings looking for members of the opposite team. Black light effects make for a fun game atmosphere! High tech effects add a little excitement to your game as your gun launches grenades and sentinal targets provide an opportunity to rack up points for your team. Once the game is over, players exit the arena, return their vests and blasters and pick up their scorecards. Each game is 15 minutes long, which includes time for the safety video, vesting and game play. Who Can Play? Players 7 years of age and older can play on their own. Players 5 and 6 years old, can play when accompanied by a playing/paying adult. Each 5 and 6 year old must have one adult playing along with them. One adult can not play with multiple 5 and 6 year olds! Unfortunately due to insurance rules kids under the age of 5 are unable to play. Reserve Your Spot Online: You can reserve your spot in a game before you even come into the arena! Click the link below to reserve a game time online. Remember to arrive 10 minutes prior to your game time. Your safety briefing will start at your game start time. If you do not arrive by your scheduled time you will have forfeited your spot in the game, and no refunds will be provided! Reservations are highly recommended on weekends and school holidays as laser tag time slots book up quickly! How do I reserve two games for $14.00 plus tax? This offer is valid for two games played by the same player. To take advantage of this price, reserve your first game time at $7.50 plus tax. Once you have placed that game in your cart, the system will give you the option to add a second game of laser tag, or a game of mini golf, for the same player at $6.50 plus tax. 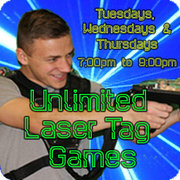 You must schedule your second laser tag game at a different time slot (on the same day) than the first game. This offer can not be split between two players.